BOSTON, MA, MARCH 19, 2018 – Spectrum Enterprise, Comcast, Cox, and Altice USA have gained a rank position on the 2017 U.S. Cable MSO Ethernet LEADERBOARD, according to Vertical Systems Group’s latest research. The Cable MSO LEADERBOARD, which ranks cable multiple-system operators (MSOs) in order based on U.S. retail Ethernet port share for this segment, is an industry benchmark for measuring Ethernet market presence. 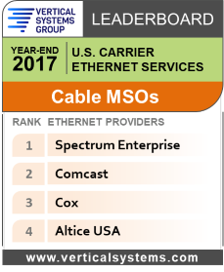 To qualify for the 2017 U.S. Cable MSO Ethernet LEADERBOARD, companies must achieve either a top rank or a Challenge Tier citation on the 2017 U.S. Carrier Ethernet LEADERBOARD. Cable MSO is one of three U.S. provider segments, along with the Incumbent Carrier and Competitive Provider segments. Spectrum Enterprise retains first position on the 2017 U.S. Cable MSO Ethernet LEADERBOARD, driven by strong growth in fiber-based Ethernet connections. Comcast continues to hold second position, followed by Cox in third. Each of these companies also holds a top rank on the 2017 U.S. Carrier Ethernet market benchmark. Altice, which received a 2017 U.S. Challenge Tier citation, holds fourth position in the Cable MSO segment. Leading Cable MSOs have made strategic commitments to deep fiber buildouts, aggressive service pricing, and market expansion to include mid-market and national enterprises. Spectrum Enterprise is the top Cable MSO on the U.S. Fiber Lit Buildings LEADERBOARD. Comcast had the highest organic growth rate of companies across all 2017 U.S. Carrier Ethernet LEADERBOARDs. Other companies in the Cable MSO segment include the following (in alphabetical order): Armstrong Business Solutions, Atlantic Broadband Business, BendBroadband Business, Cable One Business, Metrocast Business Services, Midco, MediaCom, RCN Business, WOW!Business and other cable companies selling retail U.S. Ethernet services.